Last week I introduced some new engagement ring designs in my wedding store on Etsy. This time I went a bit different route than I usually take. Instead of carving all these designs in wax, then casting them, finish and set expensive stones, I went digital. 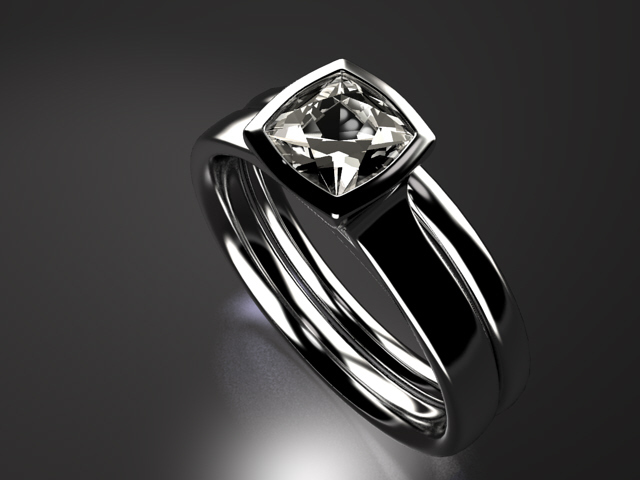 I did model them in CAD and rendered photo realistic images of them in different metal options. I finally started using my new learned 3D CAD skills that I spend endless hours last year learning and practicing it during the RAW challenge. Hopefully all that hard work will ultimately pay off. All are modeled in Rhino4 with T-splines plugin and rendered in Brazil for Rhino. Here a few of those new ring designs. All use Moissanites as they are perfect durable gem stones for engagement rings and rings are available in different metal options. Other gem stones could be used with these designs too. Moissanite Full Bezel Engagement ring with optional wedding band. 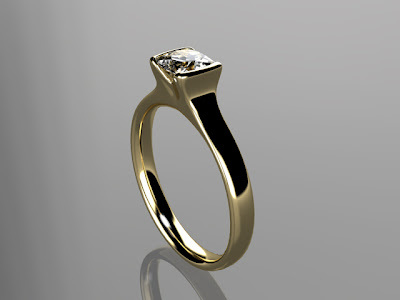 Available in Silver/Palladium, 14K yellow gold, white gold and Palladium upon request. All those designs are variations for similar setting types I have done before, like my Fold ring collection. I pretty well understand how I will have to make them once an order comes in, how they will look and know that proportions will work. The thing that really got me moving in this direction was calculating my expenses for my 2011 taxes. 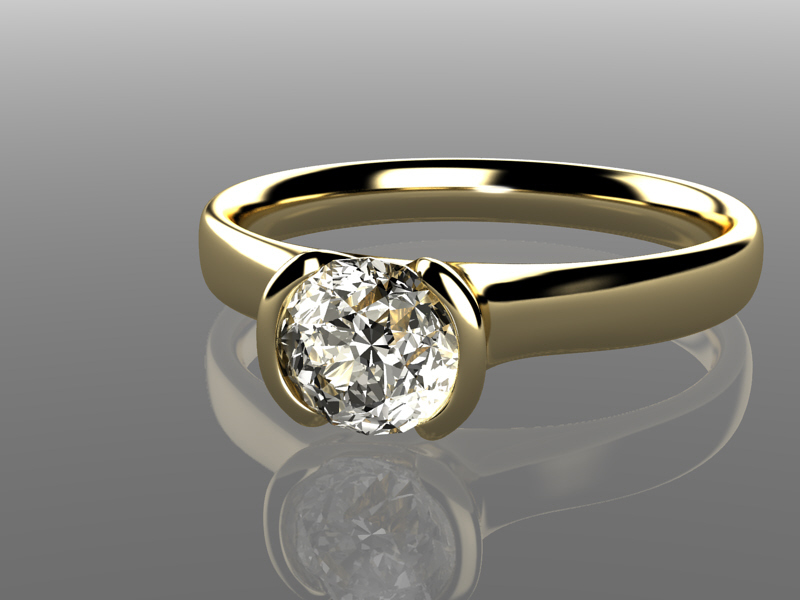 Seeing the amount of money I spend on developing new designs in the last year, spending thousands on buying stones and precious metals, made me rethink my strategy for this year. All that money spend is money I don't have to pay my mortgage or feed myself. To keep doing what I love to do, I need to start running my business smarter. Rings I produced in metal to be able to photograph them and list them in my shop, often stay a long time with me. It can take weeks, month or years to actually be able to sell the one I have in stock. I learned that with engagement rings people almost always request some slight modifications. Those can be a different metal, wider or narrower bands, different finish, different size, type or color of a gem stone, etc. Plus everyone needs a different ring size. 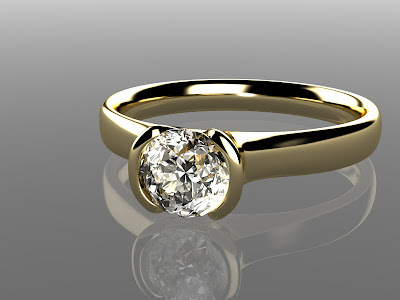 Once a stone is set in a ring, it is pretty tricky to resize it. It works with some stones and usually within a small size range. 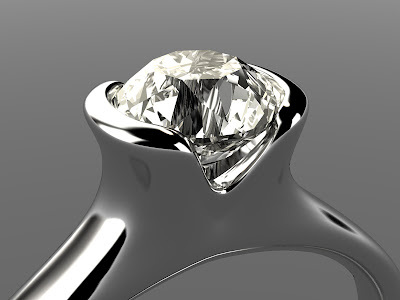 But more often than not it is better to redo the ring to the correct size and dimensions. I did already move towards taking photos with the rings 90% finished but the stones just laid in the settings without tightening the rim over the stone. This allowed me to remove it and size it better without risking to damage a stone during the soldering. Still, sometimes the settings look slightly different with the stone not fully set. Once the metal is moved over the rim of a stone, the setting usually looks a bit smoother, all is tight and nicely finished. 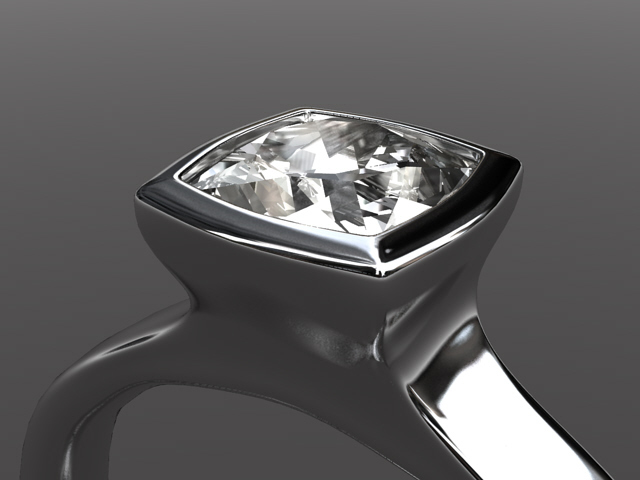 Even with that approach I could not resize more than 2 sizes up or down without affecting the overall shape and integrity of the ring. 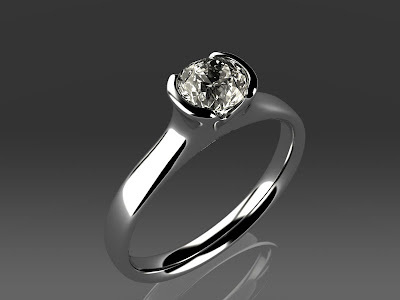 Cushion Moissanite in Palladium or also available in Silver/Palladium. Last month I finally had a break through with 3d modelling and actually really enjoy working with it. It's a great tool to try out a few variations of a design and make decisions quickly without investing too much money. It still takes considerable amount of time to model my designs in 3D. Photo realistic rendering also is a time sucker. It's easy to spend hours and hours on the computer trying to get the lights and reflections on the metal just right. It really requires me to remember what I learned in high school and college about physics, optics & mathematics. It's all very geeky, which I actually love. It can be frustrating at times but great when things finally work. I guess with time it will get faster as I will figure out some standard settings to use. Plus the images will only get better with more knowledge of the software. I love that I can show the same design in white metals and yellow gold options relatively quickly and without the expense of buying gold at all time high prices. I am already working on some custom orders for these new designs, all are modified from the original by using larger stones and applying different finishes on the metal. When an order comes in I mostly still carve the rings by hand in wax. I actually photographed some stages of carving a model in wax and will post them to the blog in the next days. This will show how to bring those digital designs to life and on the hands of a lucky bride. The current design I am hand modelling is this setting with a 5.5 mm cushion Moissanite, made in Silver/Palladium alloy with matching wedding band. Both rings will get a hammered texture. Cushion Cut Moissanite in Full bezel setting. There will be a few more designs in the future that will need to be 3D printed or milled by a CNC machine as they are a bit more complicated and would be harder to carve by hand. It's not impossible to hard carve them but sometimes it's just more efficient to choose a different tool. Since I don't own a mill or 3D printer, I need to send those out to a service bureau. It takes a bit longer to get those models back and fewer modifications will be possible. I am still continuing to produce new designs directly in wax and metal without going digital. Especially for one-of-a-kind gem stones and unique one off designs it is still the most effective way. 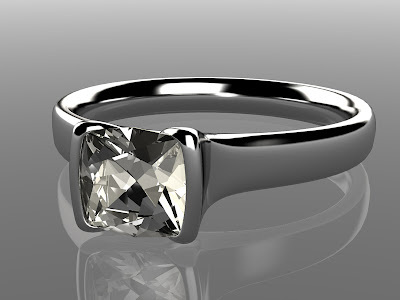 Using CAD is currently better for designs that can be replicated again especially with stones that are commercially available in constant sizes and colors. Moissanites are perfect for that and I love working with them. So far the response has be great and I got already a few communications going with potential customers for their engagement rings. I am really looking forward to seeing them all come to life.